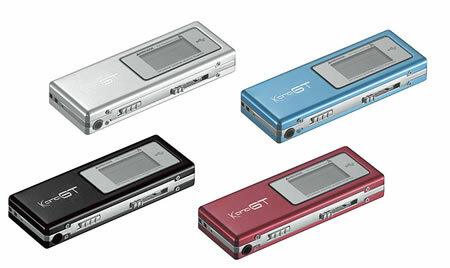 The portable MP3/WMA audio player GH-KANA-GT series from Green House Corporation adds a built in FM transmitter. The player is available in 4 different colors:-blue, red, black and silver. The MP3/WMA flash player with 512MB memory capacity has bit rate MP3 32~320kbps and WMA 48~192kbps and supports CBR/VBR.The built in FM transmitter lets you enjoy your favorite MP3 music in your car etc.The ear phone socket is used for antenna during FM transmission. With 7 band graphic equalizer, the player can be used as a mass storage USB device and voice recorder also. The built in lithium ion battery lasts approximately for 7 hours and for 4 hours during FM transmission. The Green House GH-KANA-GT player measures 83×29×12mmand weighs approximately 36g.Available approximately for 8,980 Yen($77) from early August.